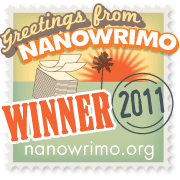 The buzz for NaNoWriMo (National Novel Writing Month) is in full swing on the writer’s blogs and chat groups. I’m torn about participating this year. I probably will not because Book Two of The Black Wing Chronicles is in its second draft now and I really won’t have the time to crank out 50k words for fresh novel. It’s a little-known fact that SOVRAN’S PAWN was a pinch-hit NaNo Novel. Two family crises in succession took the wind out of my sails for the Southern Humor story I was working on, so I replaced it with a the back story for my REAL novel, a space opera adventure on which I’d written nearly as many words. By the end of the month, I had the first draft for what would become SOVRAN’S PAWN, a novel I never intended to write. I mentioned the project in my personal blog that has pretty much sat disused since SOVRAN’S PAWN was released this past spring. I considered the substitution cheating, but my NaNo buddies encouraged me to count it as a win since word counts had been comparable and I’d finished the first draft of the novel in the process. NaNoWriMo is a wonderful exercise for writers and wannabes. I strongly encourage anyone who has entertained the idea of writing a novel to give it a try. The discipline needed to simply sit down and write to a goal, with no self-editing is an invaluable experience. So many writers get into the habit of not finishing things because they don’t finish a first draft, but continually revise and edit. The first draft is a free-for-all death match between writer and self-editor. Anything, no matter how patently ridiculous, should be allowed in the first draft. Daily word goals are important if you hope to make forward progress on a project. It’s vital to be accountable to someone for your progress on your writing. Don’t spend a lot of time rereading what you’ve written until the end of the first draft. It’s not supposed to be perfect. It’s supposed to tell a story. It’s important to do as much advance planning and story mapping as possible before writing the first words on your first draft. The outline is a suggestion, a guide to keep you from wandering too far into the wilderness, and it’s okay to stray a little if you discover something interesting. Writers MAKE time to write, they don’t fiddle around wishing it would appear. Fantastic, Chantal! Best of luck! It *is* possible to write 50k words in 30 days. Good advice. I’m going to be doing NaNo with my daughter and a couple of her friends this year. Did Script Frenzy last year with her class and it was a lot of fun.